1. What type of image do I need? Deciding exactly what kind of image you’re looking for is important. Is it a map, an illustration, a specific art work or a photograph of a historical event? Making this determination will help you decide which types of databases or search engines to use, but you should also consider using the type of image as part of your keyword search (e.g. map, historical, illustration). 2. What subject area would include the image? This is an important step because many image databases are subject specific. If you need an image of a patient with rheumatoid arthritis, you probably won’t find what you need in an art related database. That said, there are also large general image collections that can be useful to search as well. 3. Is the image specific or general? Looking for pictures of a dog is much different from looking for Giacomo Balla’s Dynamism of a Dog on a Leash. If you’re looking for a very specific image, you’ll want to use as much information about the image as possible and a subject oriented database. Find images that you can use and remix across several open archives. Site currently in beta. Image Results Page allows limiting by Image Size, Color, Type (e.g., Line Drawing) and other options. Filter your results by color, shape, size, etc. or use Image Match to find similar images. Try searching by color or form. Use advanced search to refine your searching. Click on the camera in the searchbox to load or link to an image for comparison. 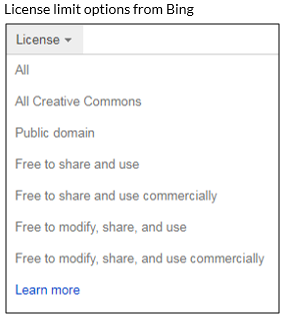 Google, Bing, YAHOO!, and other search tools permit users to filter by type of image license. Free to share and use commercially: Changing and editing not allowed, but using and sharing is permitted. Commercial and noncommercial use allowed.